The cylinder dipole has proven to be a indoor HF-antenna with the size of a VHF/UHF-antenna. The cylinder dipole with Monster energy cans is working fine on 15 m.
This table gives an inside on the number of CW contest QSO's that I made with cylinder dipoles per band and per contest. In the table, QSO means a single QSO outside a contest. All QSO's were made with 4 W or less. Most of the QSO's were made with the cylinder dipole with two Monster cans. I noticed that there is NO sharp boundary, but the the Monster seem to work better on 21 MHz than on 14 MHz. It is not easy to compare antennas on different bands or in different contests, because the propagation has much more influence than the used frequency. The Monster cylinder dipole, made of two Monster energy cans of 500 ml is a good, easy to build indoor antenna for 15 m, but also works on 10 m and 20 m. If you want to get acquaint with the indoor cylinder dipole, I suggest to build the cylinder dipole with Monster cans and a coil with 9 turns on a coil former of 80 mm. 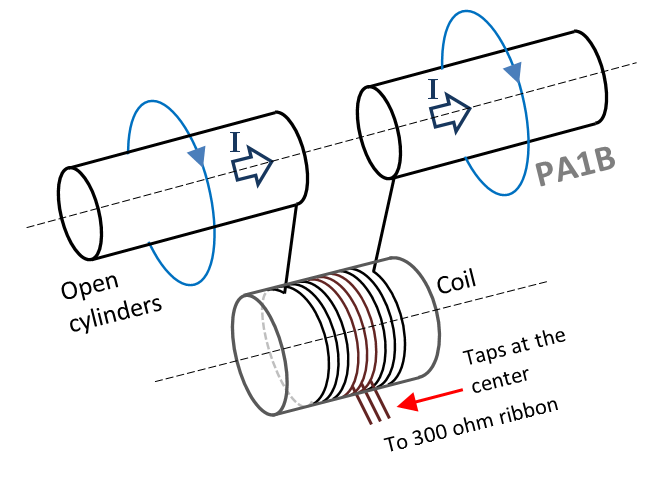 The cylinder dipole is fed on two taps at the center of the coil that are ONE turn apart. I never heard the transmission of SAQ on 17.2 kHz in CW, my self on the air. So last December I wanted to install my active loop antenna with 12 turns and a the frequency converter to listen, but . . . I was to late. It would take hours to figure out, how to connect the circuits, that were last used, years ago. I thought that I had all day to prepare, on the 24th of December. But when I looked it up, on internet, I noticed that the transmission would start within 15 minutes. hi. I immediately decided to follow the transmission on internet and I liked it very much. I watched the live stream. The live stream shows what is happening at the machine. You can see the operators in their blue shirts. At 7:47 utc I saw the CW operator take his place behind the key. You could hear that the text vvv de SAQ now was given by hand. When I started to watch there were already 66 persons watching. At the end of the transmission 119 persons were watching. I sharpened my pencil and wrote down the text. I enjoyed it very much. I like the live stream and just taking the Morse code by hand behind the computer in the shack. hi. Thanks to the SAQ team for the interesting transmission. SAQ is special station from Sweden which operates on 17.2 kHz. The power is generated by a generator. Please visit www.alexander.n.se for info. Here is the video of the transmission that I followed. In the video at 5:40 vvvv vvvv de SAQ SAQ starts, automatically keyed, until 16:53 min. At 17:00 minutes in the video, the CW operator takes over. The cylinder dipole consist of two open aluminium cylinders and a coil. The coil is connected between the cylinders and is hanging below the cylinders. I constructed my first cylinder dipoles from aluminium energy drink cans that I found on the street. To get open cylinders, I remove the top and the bottom of the cans. The cylinder dipole, that is tuned to 15 m, but also works very good on 10 m, consists of two aluminium energy drink cans of 500 ml. The top and the bottom of the cans were removed. The two cylinders form the radiators of the cylinder dipole. The current on the surface of the cylinders, causes the radiation. The coil has 9 turns and is wound on a PVC tube with a diameter of 80 mm. The taps are one turn apart. I have a lot of fun with this cylinder dipole in the shack at the first floor, 4 meter above the ground. This cylinder dipole can also be used on 20 m, with lower efficiency. The cylinders show a large self capacity. This capacity is much larger than the capacity of a wire of the same length as the cans. The capacity of the cylinders and the induction of the coil form a parallel LC resonant circuit. The impedance of this LC circuit is high at resonance. Please notice, that this parallel resonance, is what makes the difference between the cylinder dipole and a dipole with very short wires. The cylinder dipole is tuned by choosing the number of turns of the coil. I made taps, at the center of the coil. The connection on the taps of the coil, form a feed point with low impedance, to which the 300 ohm twin lead is connected. The lower the number of turns between the taps, the lower the impedance will be. I had good results with the taps just ONE turn apart. Please notice, that because the taps are placed at center the coil, the ribbon will not radiate it self. The cylinder dipole is matched (not tuned) by the symmetrical tuner in the shack. The tuner is adjusted to the lowest SWR. The cylinder dipole can be used as a multi band antenna, simply by matching the antenna to a SWR of 1:1 on the band that you want to use. That's all. I am curious about your results. 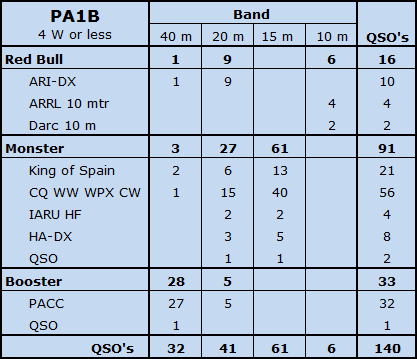 This table shows all the confirmed CW QSO's from September 2003 - August 2014, that I made under the call PA1B. As a milliwatt enthusiast, I lower my power when the S-meter goes up. I often use the lowest possible power in each QSO. I use QRPp, when ever I can, but also use QRP when it is necessary to make the QSO. In most QSO's, I use S&P. This is search and pounce. I search on the band and answer a CQ of a loud station. I start with a low power and only increase my power when I am sure that my signal is not heard. I use attenuators to lower the power for QRPpp and QRPp. In every QSO that I make, I note my power in my log. The table shows 12 power categories from 1 mW up to 5 Watts. But please notice that a QSO in the power category of 50 mW, can be made with a lower power than 50 mW. A power of 30 mW, 36 mW, 41 mW, 45 mW and 50 mW, are all displayed in the power category of 50 mW. The total number 8 x 10 + 7 = 87 DXCC's. I have made this table with great care. Please let my know, if something is not, what it should be.